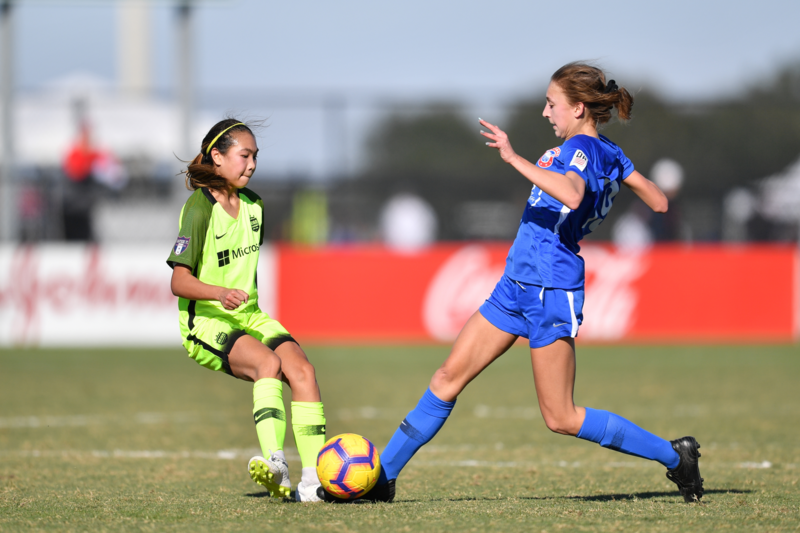 A pair of goals in the first 11 minutes of play boosted Nationals to a 2-0 victory over Reign Academy in the first girls' feature game of the 2018 U.S. Soccer Development Academy Winter Showcase. A quick strike breakaway opened the scoring less than 90 seconds into the game, while a banger from outside the box in the 11th secured the result for Nationals. Nationals scored 41 goals in its first 11 games of the Academy season, and it didn't take long for the Michigan-based club to find the back of the net in Florida. Winning the ball after a Reign corner kick, Nationals jumped on the opportunity for a counterattack. Francesca Mudd pounced on the loose ball off the service and threaded a great ball through the midfield and past three defenders to Morgan Roy streaking up the left wing. Roy, a 2005-birth year player playing up with the U-15s, sped away from the Seattle defense and was left with just the goalkeeper to beat. As Roy approached the six-yard box, she slotted it to the right post for the game's opening goal. The Mid-America Division leaders doubled their advantage in the 11th minute. Once again starting the attack, Mudd stole the ball near midfield and Nationals worked it across the field from left to right. On a nice run up the wing, Jasmine Blue played it up to Roy, who dished to Emily O'Malley after a few nifty dribbles of her own. O'Malley one-timed a rocket towards the net, launching it to the top right corner from outside the box. Nationals will face Charlotte Soccer Academy and Oakwood Soccer Club in its next two Showcase games, while Reign Academy will take on Oakwood and Penn Fusion Soccer Academy.